One gallon of Kool Fog Low-Lying Fog Fluid from ADJ. Designed to make the a high quality crisp white cloud low to the floor when used with an American DJ Low-Lying Fog Machine. Will stay low longer than standard fog juice. There aren't many things cooler than dancing to music and lights while dense white fog flows around your ankles. Thanks to the Kool Fog Low-Lying Fog Juice from ADJ you can make this happen at your next event. Like the famous effect of putting dry ice in water Kool Fog, when used with a low-lying fog machine, creates a very similar low-lying layer that will last longer than standard fog juice. Your crowd will be more than pleased with the fog layer on the dance floor this juice will make, you'll be the hit of every party, Halloween event, theatre production, or regular just-having-a-good-time party. Combining a fog machine with lasers and lights makes the light more visible thus creating a far more exciting and dynamic atmosphere. 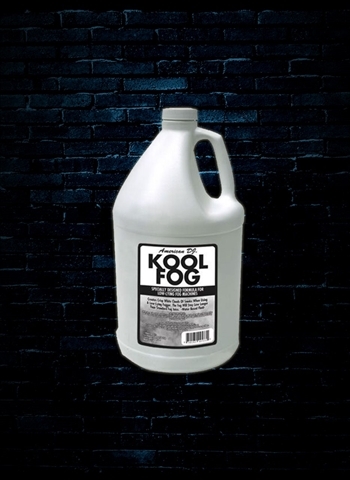 Fog Juice may make things foggy but your choice is clear, get Kool Fog Low-Lying Fog Juice from ADJ today and take your events to a whole new level.